BOSTON – Samuel Adams and Weihenstephan toast the return of Infinium, the beer world’s anticipated unification of American innovation and old-world tradition. More than two years in the making, Infinium elevates the centuries-old German purity law to new heights and is the first new beer style created under the Reinheitsgebot – old-world German purity law requiring beer to include only four ingredients: water, yeast, malt and hops – in more than 100 years. First released in 2010, Infinium is the outcome of a two-year corss-continental collaboration between Jim Koch, brewer and founder of Samuel Adams beers, and Dr. Josef Schr├ñdler, managing director of Germany’s Weihenstephan Brewery. 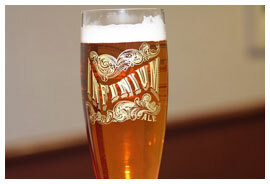 Infinium is a special edition brew available each year only during the holiday season. Back by drinker demand, Infinium, the champagne-like collaboration brew is sure to top the list as 2011’s ultimate celebratory beverage. Infinium pours a deep golden color with fine bubbles and has a fruity, elegant aroma. Its crisp acidity gives it a dryness and tartness on the palate that is balanced with a smooth malt body. Infinium retails for $19.99 per 750mL cork-finished bottle and will be available nationwide in November 2011 while supplies last. It checks in at 10.3 percent ABV. Below is a video French Oak TV made at last year’s Infinium tasting and release party.